How does X11 clipboard handle multiple data formats? It probably happened to you as well - sometimes when you copy a text from some web page into your rich-text e-mail draft in your favorite webmail client, you dislike the fact that the pasted piece has a different font/size/weight.. it somehow remembers the style (often images, when selected). How is it than that if you paste the same into your favorite text editor like Vim, there's no HTML, just the plain text? It seems that clipboard maintains the selected data in various formats. How can one access data in any one of those formats (programmatically or with some utility)? How does the X11 clipboard work? The app you copy from advertises formats (mostly identified by MIME types) it can provide. The app you paste into has to pick its preferred format and request that one from the source app. The reason you may not see all style info transferred is that the apps don't both support a common format that includes the style info. You can also see issues because an app may for example try to paste HTML, but not really be able to handle all HTML. Or the apps may be buggy, or may not agree on what a particular MIME type really means. Almost all apps can both copy and paste plain text, of course, but beyond that it's touch and go. If you don't get what seems to make sense, you could file a bug vs. one of the apps. Not the answer you're looking for? 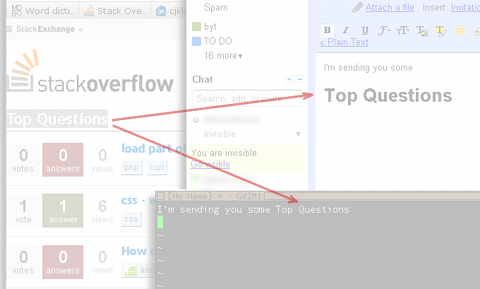 Browse other questions tagged text clipboard x11 xorg or ask your own question. How can Python access the X11 clipboard? How to set HTML to clipboard in C#? How to copy both - HTML and text to the clipboard? How does Trello access the user's clipboard? QMimeData: How to properly copy formatted text to clipboard?